Why am I being notified about leads that are not assigned to me? How do I turn off new lead email notifications? How do I turn on or off new lead popup notifications? How do I turn on or off new lead text notifications? You have settings in your Preferences to notify you of the activity of other people on your team. Click My Preferences (Hover over your name on the top right), and look at the "Auto-Assignment and New Lead Email Notification Settings" box. If you have "Notify me of ALL new web leads" or "Notify me of ALL new web form leads" checked, uncheck that box. Also in My Preferences, look at the "History Notification Settings" section. If you have this turned on, make sure the "Notify me about" dropdown has "Leads Assigned to me" selected. If you are still having an issue, click below to submit a ticket. How do I stop receiving new lead emails? Click on one of your email notifications from Blitz. Select the conditions for the filters by clicking the check boxes. We recommend putting Blitz's email address as the sender (leads@blitzleadmanager.com), as well as keywords from the subject ("Assigned to you" for example). 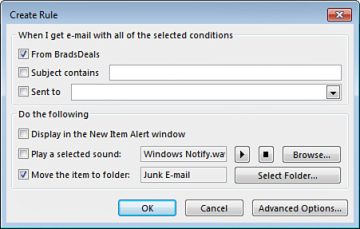 In the “Do the following” section, choose what you would like Outlook to do with messages that meet the above conditions. To move the message to a different folder automatically, specify the folder in the last option. Click OK, and OK again if you would like to run the rule immediately. To manage or delete existing rules, go to Home > Manage Rules and Alerts. How do I turn on or off new lead popup and email notifications? 1. Click the My Preferences tab. 2. In the "Popup Notification Settings" box, find the checkbox for "Enable popup notifications for new leads." If this is checked, you will receive popups. If it is not checked, you will not. Same goes for Email Notifications such as "Enable for email link clicks*” and the “Enable for email opens*" If either of these are checked, you will receive popups. If it is not checked, you will not. *Please note you will only receive popup notifications when either a new lead is assigned to you, or when any new lead comes in and you have "Notify me of ALL new web leads" selected in the "Auto-Assignment and New Lead Email Notification Settings" section. In the bottom left corner you will see the "Mobile Phone & Text Message Settings" box , enter your mobile information and select "Notify Me Via Text Message For: New Leads". *Please note you will only receive text notifications when either a new lead is assigned to you, or when any new lead comes in and you have "Notify me of ALL new web leads" selected in the "Auto-Assignment and New Lead Email Notification Settings" section.